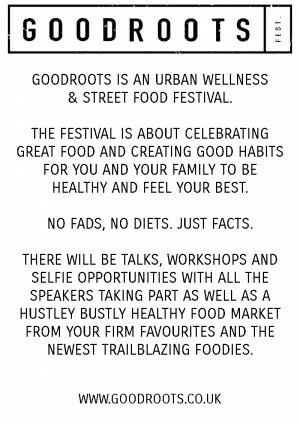 Goodroots is an urban wellness and street food festival. The festival is about celebrating great food and creating good habits for you and your family to be healthy and feel your best. No fads, no diets. Just facts. There will be talks and workshops and selfie opportunities with all the speakers taking part as well as a hustley bustley healthy food market from your firm favourites and the newest trailblazing foodies. To ensure tickets are delivered safely and securely and to keep the price as low as possible for you, the ticket buyer, Good Roots generally uses our E-ticket system unless otherwise stated. When you purchase tickets through Good Roots, the full face value of the ticket is shown. This price is the price set by the event promoter and we pay this full amount to the promoter without any deductions.